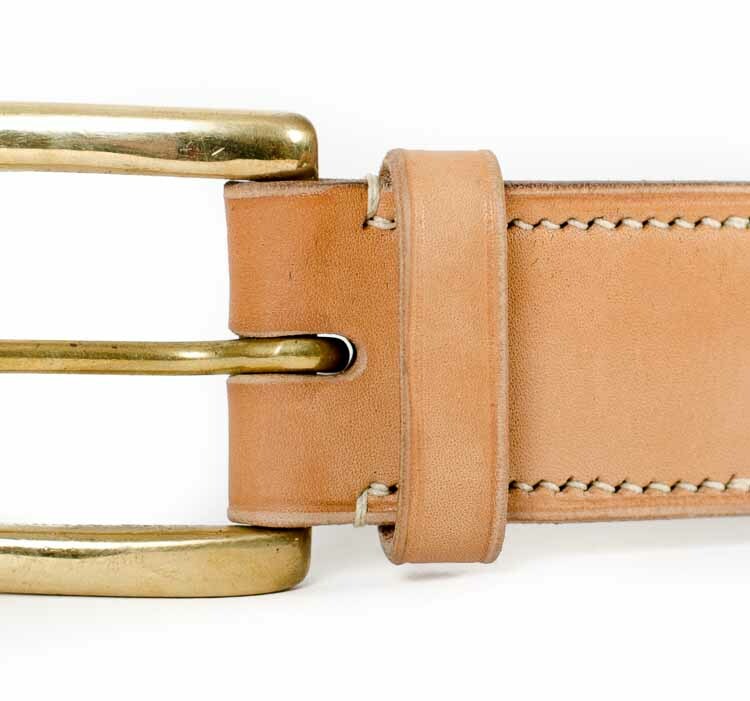 What makes a bespoke handmade belt special? It is the attention to every detail, no matter how small, that goes in to the construction that makes a handmade belt so special. Traditional techniques that have been developed and refined over centuries and the finest material combine to make a belt that will last for years and years and get more beautiful with age. Starting with the finest bridle leather, only the best and strongest part of the hide is used. The belt blank is cut parallel to the spine as this has the greatest tensile strength. Many belts are cut from the shoulders perpendicular to the spine and consequently stretch more. Our belts are made specifically for you, to whatever length you require right down to the last 1/8 inch, so that they do up to the middle hole, no more having to make do with ill fitting standard small, medium or large belts. The belt blank is cut from the strongest and most expensive part of the hide. The antique plough gauge we use to cut the blank was made by H Brindley and is over 100 years old and still going strong! The strap point is cut from the end of the hide nearest the tail as this is the firmest part of the leather so best able to withstand the wear of being pulled through the buckle. 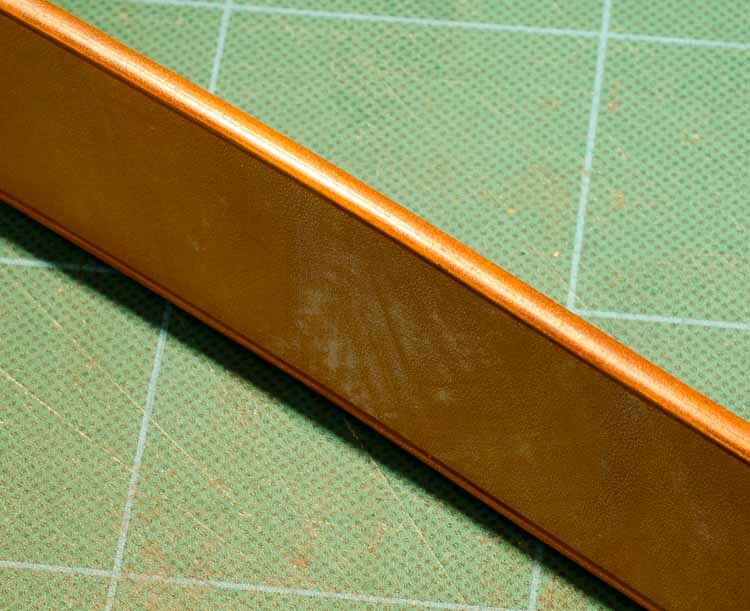 The raw edge of the cut belt blank is very rough. It goes through a lengthy six stage process of sanding, slicking, dyeing and burnishing to produce a smooth and glossy surface that is a joy to handle. The crease line running the length of the belt is produced by a heated crease iron. The line is both decorative and functional, compressing the fibres at the edge making them more resistant to wear. 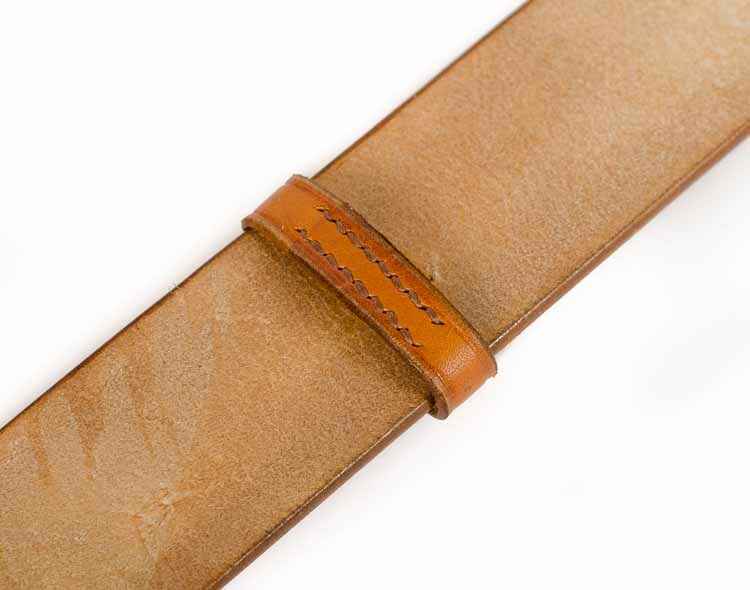 All of our bridle hide belts are hand stitched with waxed linen thread. Far stronger than machine sewing, the thread passes from front to back with each stitch forming a knot. So in the unlikely event of one breaking the rest will not unravel. The corners of the buckle return are chipped off and stitched over to stop them catching and rubbing up in use. The holes the buckle fastens through are oval rather than round, this allows the tongue to sit flatter. As standard we punch seven holes spaced 1” apart, but you can have any number you like - or even just a single hole! We even hand stitch the loose running loop. The stitching is never seen but we believe that every detail of our belts deserves the same care and attention, no matter how small or hidden. 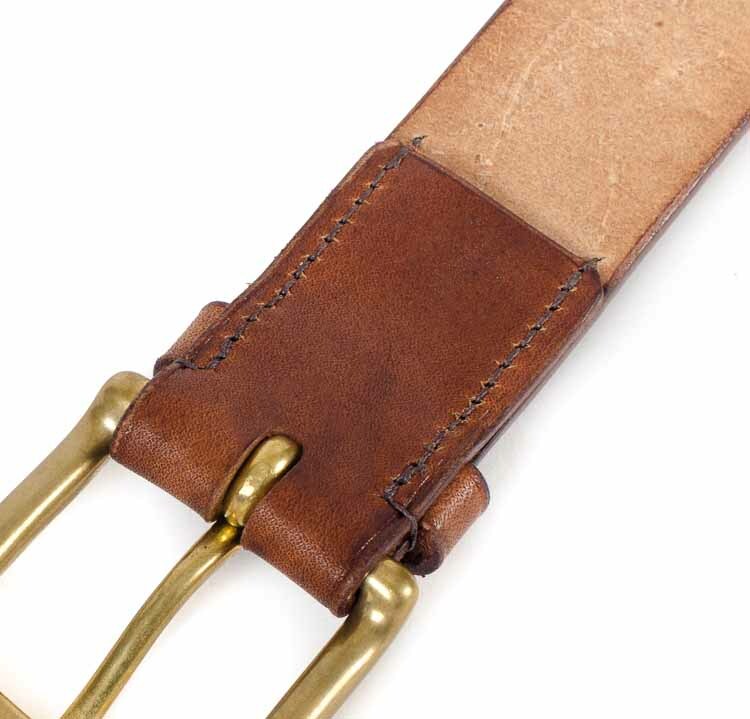 When ordering online through our website you can select the leather, the width, the buckle, the colour of the stitching and the length. But if you would like any other customisations please don't hesitate to contact us to discuss your requirements. As each belt is made to order in our workshop it can be altered in any way you like. Wider or additional fixed loops, brass loops, the number of holes and their spacing, extra rows of stitching, in matching or contrasting colours, loops for attaching key chains and contrasting edge dyeing are just some of the options we are happy to provide. All of the bridle hide we use comes from J & F.J. Baker in Devon. It is the last remaining oak bark tannery in the UK and we believe produces the finest bridle hide anywhere in the world. The Baker family bought the business in 1862 and the site in Colyton, Devon has been a tannery since the Roman era. They supply the finest shoemakers, saddlers and leatherworkers. Oak bark tanning is a long slow process, taking 14 months to produce each piece of leather. Modern tanning methods are much faster but simply cannot match the strength, feel and character of oak bark bridle hide. The leather is aniline dyed by hand to allow the full beauty of the grain to show through. The flesh side is left unstained to show that it is genuine oak bark leather. The tanning is an entirely sustainable process combining the best local hides and natural materials with water from the river Coly which runs alongside the tannery. Visiting the tannery is a chance to step back in time and connect with living history. It is fascinating to walk through the beautiful and atmospheric Georgian and Victorian buildings and experience the sights, sounds and smells of a process that has remained virtually unchanged for centuries. All of our buckles are cast in the last remaining commercial brass buckle foundry in the UK. Founded by the Stanley Brothers in 1832 they use green sand casting, a method that dates back thousands of years, to produce beautiful timeless buckles. The pattern book goes back to the founding of the company and all of the original designs are still available. 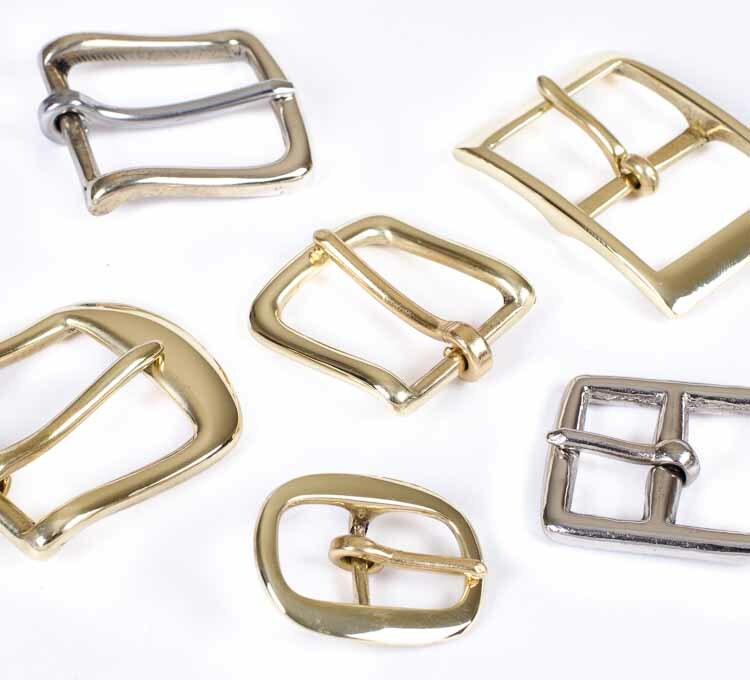 These classic shapes also inform the design of all modern fashion buckles. We polish and wax each buckle to provide a bright mirror finish. But if you would prefer a more matt finish simply wipe the buckle with white spirit to remove the wax and allow the buckle to tarnish naturally. 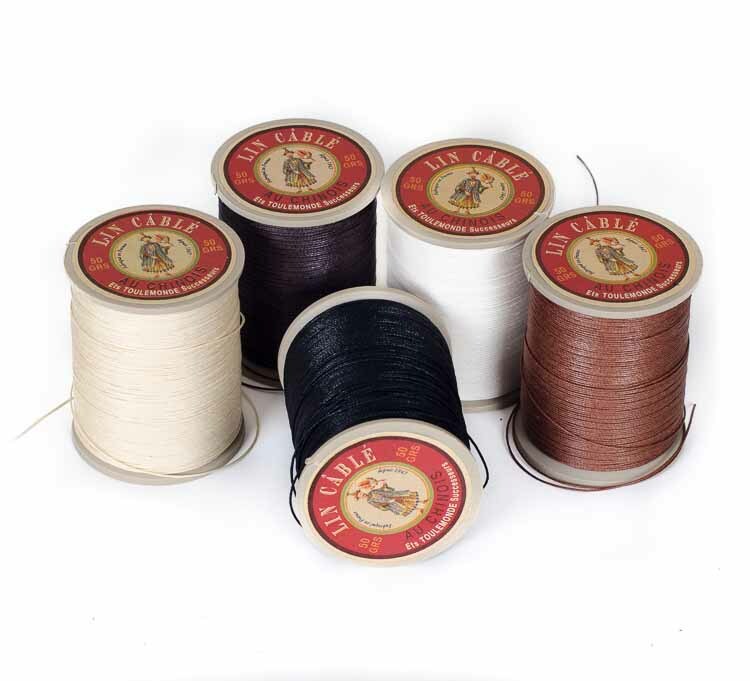 Fil au Chinois Lin Câblé thread is the best thread made for leather work and used by the finest luxury leather goods houses. Unlike other linen threads, the twisted strands are twisted together a second time before being immersed in beeswax and then brushed with horsehair and stretched to produce a wonderfully smooth and resilient thread that makes the most beautiful rounded stitches. The Fil au Chinois brand was first registered in 1842, having been founded 20 years earlier in Lille. At the end of the 20th century it had fallen in to decline due to the competition from inferior cheap imported thread. Thankfully it was rescued by the Toulemonde brothers in 2007 who continue to produce these peerless threads in their factory in northern France, many on the original machines which have been lovingly restored.